There are so many good and honourable things in Nandita Das’s Manto – which intersperses vignettes from Saadat Hasan Manto’s life with scenes from his short stories – that I feel a little sheepish mentioning the moments which aren’t central to the film but which sent me into a pleasant reverie. 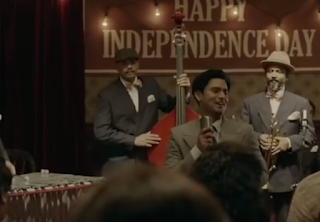 One was the early scene, set in the mid-1940s, where the writers Ismat Chughtai, Rajinder Singh Bedi and Krishan Chander sit at a table with Manto, bantering away and no doubt thinking about the challenges and repercussions of India’s impending independence. Watching this was to be reminded that Bedi had scripted Satyakam, which has a scene set in 1946 where a group of idealistic youngsters discuss how things will change forever once the British leave. The other was the scene at the film-industry party where Manto mingles with such personalities as the singer Jaddanbai (played by Ila Arun), her teenage daughter Nargis – headed for movie stardom – and one of Hindi cinema’s first major male stars, Ashok Kumar. For anyone who knows the young Kumar – through films of the 1930s or 40s, or through the writings of Manto, Nabendu Ghosh and other contemporaries – an essence of the man was recognizable in Bhanu Uday’s performance even though there was no recourse to caricature. Tapping a glass to make an announcement, then swaying unselfconsciously as Jaddanbai sings, here is the star who was steeped in a tradition of Indian classical music but also slipped easily into an urbane, westernized avatar, becoming a producer, mentor and an anchoring figure in the Hindi-film industry. I liked that Das didn’t underline things too much in these scenes. Discussing the film at a class a few days after watching it, I had the sly pleasure of seeing looks of astonishment spread over the students’ faces when told that the woman who sang in that party scene was the grandmother of Sanju baba – Sanjay Dutt – and that the beaming, smooth-complexioned girl next to her… that was Dutt’s mummy, of whom they had seen a more fully fleshed out version in Rajkumar Hirani’s Sanju. I can’t say if these scenes and performances would have worked if this had been a full-fledged biopic about the Hindi film industry, but they worked just fine as a snapshot of an era and its people. They reminded me of scenes from Martin Scorsese’s The Aviator, such as the depiction of an episode I had first read about in a film book: Howard Hughes flies down from the clouds, lands on a beach where the 1935 film Sylvia Scarlett is being shot, and saunters across for his first meeting with Katharine Hepburn. 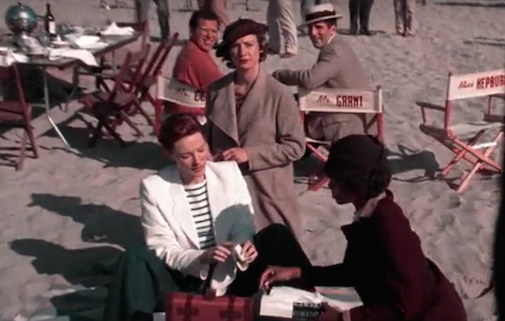 While Hughes and Hepburn (played by Leonardo Dicaprio and Cate Blanchett) are central to the film, this scene also has a split-second shot that only a bona-fide lover of old Hollywood would register: we see Cary Grant and director George Cukor looking with bemusement at the aviator. Not long after this comes a rambunctious party scene where Errol Flynn (played by Jude Law) turns on the charm, swaggers about and gets into a brawl – all within a minute or two! Though sensing that this scene was a bit of affectionate myth-indulging by Scorsese (who is a huge movie buff and historian), I also gave in to the spell: this is how it might have been like in those days, I thought. And it made me yearn for the gift of time travel. Having recently read Trisha Das’s novel Kama’s Last Sutra, in which a young archeologist is sent back to the 11th century, I could relate to the character’s awe at participating in the history she had read about – much the same way I could relate to the protagonist of Woody Allen’s Midnight in Paris, rubbing shoulders with Ernest Hemingway and Gertrude Stein in a Paris of a bygone time. For someone obsessed with cinema’s past, the nearest thing to a time machine would be a good, well-scripted film – or a long-form series! – about pivotal moments from our film history. International shows like Feud – about the Bette Davis-Joan Crawford rivalry – have managed to be seriously researched while also pleasing star-struck fans of the era in question, and there’s no reason why something along those lines can’t be done for Indian cinema. Personally, I would love a filmic depiction of V Shantaram’s early years, and the setting up of the Prabhat Film Company. From there, we can move slowly – very slowly – into the 1930s, and then let our time machine determine its own course. Any takers? I think she filmed his stories beautifully. Since those were short stories, showing them in few minutes of screen time was very effective. They also had no explanation in terms of where the characters came from etc etc, something which Manto also did. However I think the impact was missing from key scenes in the first half. Esp the train scene between Manto and Shyam. First half did have good scenes but somehow overall Manto appears as a character with very predictable and much fewer colours in his own character. I found the movie boring, going on and on on very obvious lines with too much message giving.